Hercules - The Rottweiler Saves His Owner From An Attacker. 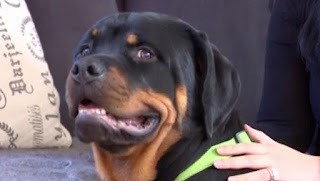 The Woodland, Texas (USA) - Catalina Humphrey was walking the 10 month old Rottweiler puppy Hercules on the popular Sawmill trail in the Grogan's Mill community around 4 p.m. when suddenly a man crept up from behind and grabbed her shoulder. “I didn’t have a purse on me. I just had my workout gear on,” Humphrey said. She was surprised when even at just a few months old, Hercules didn’t hesitate to protect her when the strange man appeared out of nowhere and forcefully grabbed her from behind. The pup reacted so quickly that neither the man nor Humphrey knew what was happening. Hercules immediately attacked the man, biting him over and over again, until he managed to get up and run away. Humphrey and Hercules sprinted home and reported the attempted attack to the police. Humphrey knows she’s lucky Hercules was there to protect her, but is still shaken by the incident.